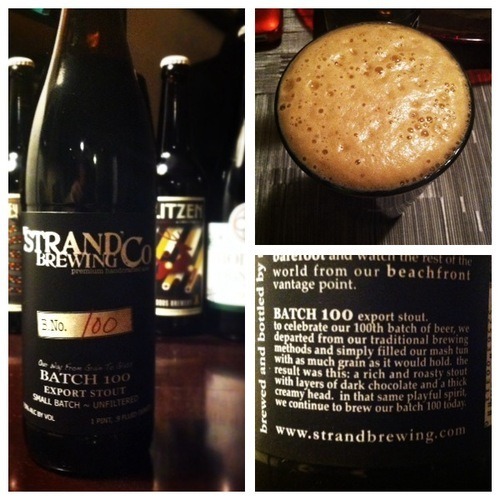 While visiting Strand Brewing Co. on Saturday, I picked up a few bottles, including their Batch 100 Stout. I picked it up specifically for the launch of this column, because next weekend will see the tapping of 2 versions of this beer on cask, which is very exciting. In fact, the first time I tasted this beer was at the Strand 4th Anniversary event, where they tapped a cask conditioned with coffee, and it was a beer that really stood out to me. The bottle version pours close to black in color with a light-caramel colored head that manages to retain its thickness. The taste has a punch of bitterness with coffee and cocoa flavor on the first sip, but goes down quite smooth. A small amount of the bitterness lingers. What I like about this beer is that at 7.5% its still strong enough to keep you interested, but not overwhelming as many American stouts can be these days. As I mentioned, there’s two casks of this beer coming out this weekend, including the coffee version, being tapped on Saturday night at Blue Palms Brewhouse as part of their tap takeover (event details here). They will also be tapping a version brewed with blood oranges at their Brewery & Taproom, which Rich told me on the weekend is the first time they have done this recipe. This is going to be interesting for the cask versions. There’s plenty of room for the coffee to build on these flavors (and it does, beautifully), but for my money, I’m much more interested in the blood orange version. This isn’t a beer that’s going to overpower the citrus flavor, but how they meld together could be something really special. Make sure you get out this weekend and try at least one of them before they are all tapped out.